Dialogue (sometimes spelled dialog) is a reciprocal conversation between two or more entities. The etymological origins of the word (in Greek διά　(diá,through) + λόγος　(logos,word,speech) concepts like flowing-through meaning) do not necessarily convey the way in which people have come to use the word, with some confusion between the prefix διά-(diá-,through) and the prefix δι-(di-, two) leading to the assumption that a dialogue is necessarily between only two parties. A dialogue as a form of communication has a verbal connotation. While communication can be an exchange of ideas and information by non-verbal signals, behaviors, as the etymology connotes, dialogue implies the use of language. A dialogue is distinguished from other communication methods such as discussions and debates. While debates are considered confrontational, dialogues emphasize listening and understanding. Martin Buber developed his philosophy on the dialogical nature of human existence and elaborated its implications in a broad range of subjects including religious consciousness, modernity, the concept of evil, ethics, education, spirituality, and Biblical hermeneutics. Because dialogue is, for a human being, the fundamental form of communication and interaction, numerous texts from antiquity have used the structure of a dialogue as a literary form. Religious texts such as the Bible, Buddhist sutras, and Confucian texts and contemporary literature have used the form of a dialogue. In philosophy, Plato's use of dialogue in his writings is often the best known. A dialogue is a fundamental and the most common form of communication for human beings. From religious texts in antiquity, including the Bible, Buddhist sutras, mythologies, to contemporary literature, a dialogue as a literary form has been widely used in diverse traditions. In the east, the genre dates back to the Sumerian dialogues and disputations (preserved in copies from the early second millennium B.C.E. ), as well as Rigvedic dialogue hymns and the Indian epic Mahabharata, while in the west, literary historians commonly suppose that Plato (c. 427 B.C.E.-c. 347 B.C.E.) introduced the systematic use of dialogue as an independent literary form: They point to his earliest experiment with the genre in the Laches. The Platonic dialogue, however, had its foundations in the mime, which the Sicilian poets Sophron and Epicharmus had cultivated half a century earlier. The works of these writers, which Plato admired and imitated, have not survived, but scholars imagine them as little plays usually presented with only two performers. The Mimes of Herodas gives some idea of their form. Plato further simplified the form and reduced it to pure argumentative conversation, while leaving intact the amusing element of character-drawing. He must have begun this about the year 405 B.C.E., and by 399, he had fully developed his use of dialogue, especially in the cycle directly inspired by the death of Socrates. All his philosophical writings, except the Apology, use this form. As the greatest of all masters of Greek prose style, Plato lifted his favorite instrument, the dialogue, to its highest splendor, and to this day he remains by far its most distinguished proficient. 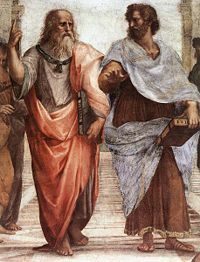 Following Plato, the dialogue became a major literary form in antiquity, and there are several examples both in Latin and Greek. Soon after Plato, Xenophon wrote his own Symposium, Aristotle is said to have written several philosophical dialogues in Plato's style (none of which have survived), and later most of the Hellenistic schools had their own dialogue. Cicero wrote some very important works in this genre, such as Orator, Res Publica, and the lost Hortensius (the latter cited by Augustine in the Confessions as the work which instilled in him his lifelong love of philosophy). In the second century C.E., Lucian of Samosata achieved a brilliant success with his ironic dialogues Of the Gods, Of the Dead, Of Love, and Of the Courtesans. In some of them, he attacks superstition and philosophical error with the sharpness of his wit; in others he merely paints scenes of modern life. The dialogue was frequently used by early Christian writers, such as Justin, Origen and Augustine, and a particularly notable dialogue from late antiquity is Boethius's Consolation of Philosophy. The genre survived up through the early scholastic period, with Peter Abelard composing his Dialogue with a Jew, a Christian and a Philosopher in the early twelfth century C.E., but later, in the wake of the powerful influence of writings by Bonaventure and Thomas Aquinas, the scholastic tradition adopted the more formal and concise genre of the summa, which largely superseded the dialogue as philosophical format. Two French writers of eminence borrowed the title of Lucian’s most famous collection; both Fontenelle (1683) and Fénelon (1712) prepared Dialogues des morts ("Dialogues of the Dead"). Contemporaneously, in 1688, the French philosopher Nicolas Malebranche published his Dialogues on Metaphysics and Religion, thus contributing to the genre's revival in philosophic circles. In English non-dramatic literature the dialogue did not see extensive use until Berkeley used it in 1713, for his Platonic treatise, Three Dialogs between Hylas and Philonous. Landor’s Imaginary Conversations (1821-1828) formed the most famous English example of dialogue in the 19th century, although the dialogues of Sir Arthur Helps also claim attention. More recently, the French returned to the original application of dialogue. The inventions of "Gyp," of Henri Lavedan, and of others, tell a mundane anecdote wittily and maliciously in conversation, would probably present a close analogy to the lost mimes of the early Sicilian poets. This kind of dialogue also appeared in English, exemplified by Anstey Guthrie, but these dialogues seem to have found less of a popular following among the English than their counterparts written by French authors. In I and Thou (1923; English translation in 1937), Buber introduced his thesis on human existence. Buber's main proposition is that we may address existence in two ways: That of the "I" towards an "IT," towards an object that is separate in itself, which one either uses or experiences; and that of the "I" towards "THOU," in which one moves into existence in a relationship without bounds. One of the major themes of the book is that human life finds its meaningfulness in relationships. All relationships, Buber contends, bring one ultimately into relationship with God, who is the Eternal Thou. For "I-It" relationships, the "It" refers to entities as discrete objects drawn from a defined set (for example, he, she, or any other objective entity defined by what makes it measurably different from other living entities). It can be said that one has as many distinct and different relationships with each "It" as there are "Its" in one's life. By contrast, the "I" in the "I-Thou" is a separate concept. This is the "I" that does not objectify any "It" but rather acknowledges a living relationship instead. The "I" in "I-Thou" is radically different than the "I" in "I-It." "I-Thou" relationships are sustained in the spirit and mind of an "I" for however long the feeling or idea of relationship is the dominant mode of perception. A person sitting next to a complete stranger on a park bench may enter into an "I-Thou" relationship with the stranger merely by beginning to think positively about people in general. The stranger is a person as well, and gets instantaneously drawn into a mental or spiritual relationship with the person whose positive thoughts necessarily include the stranger as a member of the set of persons about whom positive thoughts are directed. It is not necessary for the stranger to have any idea that he is being drawn into an "I-Thou" relationship for such a relationship to arise. Love is a subject-to-subject relationship. Like the I-Thou relation, love is not a relation of subject to object, but rather a relation in which both members in the relationship are subjects and share the unity of being. The ultimate Thou is God. In the I-Thou relation there are no barriers, and this means that man can relate directly to God. God is ever-present in human consciousness, and manifests himself in music, literature, and other forms of culture. Dialogic relations have a specific nature: They can be reduced neither to the purely logical (even if dialectical) nor to the purely linguistic (compositional-syntactic) They are possible only between complete utterances of various speaking subjects… Where there is no word and no language, there can be no dialogic relations; they cannot exist among objects or logical quantities (concepts, judgments, and so forth). Dialogic relations presuppose a language, but they do not reside within the system of language. They are impossible among elements of a language. Celebrated Brazilian educationalist Paulo Freire developed for popular education advanced dialogue as a type of classroom pedagogy. Freire held that dialogued communication allowed students and teachers to learn from one another in an environment characterized by respect and equality. A great advocate for oppressed peoples, Freire was concerned with praxis—action that is informed and linked to people’s values. Dialogued pedagogy was not only about deepening understanding; it was also about making positive changes in the world. In the past two decades, a rapidly-growing movement for dialogue has been developing. The National Coalition for Dialogue and Deliberation, for example, serves as a hub for dialogue (and deliberation) facilitators, conveners, and trainers and houses thousands of resources on these communication methodologies. Groups such as Worldwide Marriage Encounter and Retrouvaille International also use dialogue as a communication tool for married couples. Both groups teach a dialogue method that helps couples learn more about each other in non-threatening postures, which helps to foster growth in the married relationship. Mutual understanding is an essential element for building a global community which consists of socially and culturally diverse groups of people. Dialogue among them is an important step to establish peaceful and cooperative relationships. Interfaith dialogue or interfaith refers to cooperative and positive interaction between people of different religious traditions (ie. "faiths") and spiritual or humanistic beliefs, at both the individual and institutional level with the aim of deriving a common ground in belief through a concentration on similarities between faiths, understanding of values, and commitment to the world. In 1893, World’s Parliament of Religions was held in Chicago as an effort of creating a platform for an inter-religious dialogue for peace building. Following this monument event, a number of significant religious leaders such as Mohandas Karamchand Gandhi (1869–1948) contributed for inter-religious understanding by overcoming obstacles and barriers that historically separated religious communities. ↑ Emotional Competency, Dialogue: Thinking Together. Retrieved August 30, 2008. Bakhtin, M. M., Michael Holquist, and Caryl Emerson. 1986. Speech Genres and Other Late Essays. Austin: University of Texas Press ISBN 0292720467. Buber, Martin, and Ronald Gregor Smith. Between Man and Man. London: Routledge & Paul, 1949. Buber, Martin. I and Thou. New York: Scribner, 1958. Maranhão, Tullio. 1990. The Interpretation of Dialogue. Chicago: University of Chicago Press. ISBN 0226504336. Smith, Jane I. Muslims, Christians, and the Challenge of Interfaith Dialogue. New York: Oxford University Press, 2007. ISBN 0195307313. Smock, David R. Interfaith Dialogue and Peacebuilding. Washington, D.C.: United States Institute of Peace Press, 2002. ISBN 9781929223350. Walsch, Neale Donald. Conversations with God: An Uncommon Dialogue. New York: G.P. Putnam's Sons, 1996. ISBN 9780399142789. All links retrieved October 24, 2017. This page was last modified on 24 October 2017, at 20:57.